I can’t conceive of life without bobby pins, and it is my contention that they are the unsung heroines of a woman’s beauty tool kit. I wear my hair short, so I don’t often use them, but I keep a few stashed in my bag anyway. A recent purse search turned up my wallet, cell phone, a handful of loose change, a lipstick I had been searching for since last week, and three bobby pins. The spare change may come in handy, and I’m glad the lipstick finally turned up, but I tossed the bobby pins right back into my purse because I find the ingenious metal clips are as useful—or even more useful than—any multi-purpose knife. They can be used to create a halo of face framing curls or as an improvised paper clip, bookmark, screwdriver, fishhook, cherry pitter, or lock pick. Unconvinced of the bobby pin’s superiority? 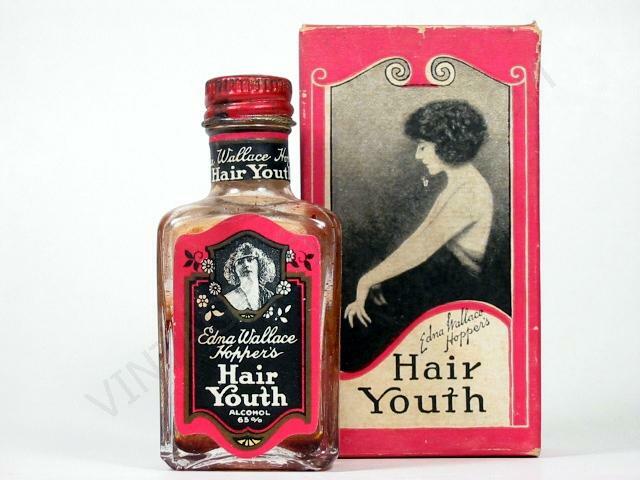 Just try holding your hair in place with any of the objects listed above. 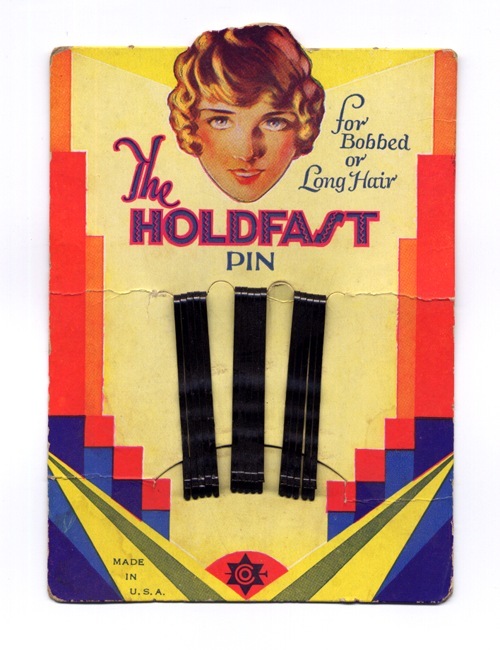 Given their usefulness, it is no wonder that at least half a dozen people have sought to take credit for the bobby pin’s invention. First was an imaginative 15th century fellow, the eponymous Robert “Bobby” Pinsworth. According to some sources, Mrs. Pinsworth was having a bad hair day when she asked her husband for something to hold an errant strand in place. Bobby came through with a uniquely designed clip that changed Mrs. P’s life. 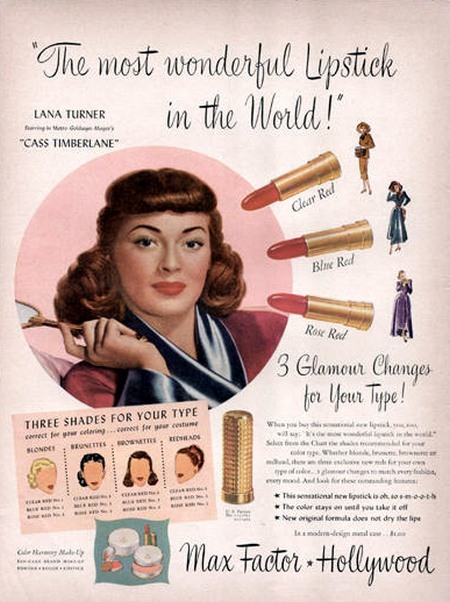 In March 1990, Luis Marco, a 1920s San Francisco cosmetics manufacturer was eulogized in a local newspaper as the originator of the bobby pin. 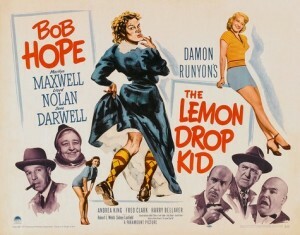 His daughter said that he had toyed with the idea of naming it the Marcus Pin, but named it after bobbed hair instead. 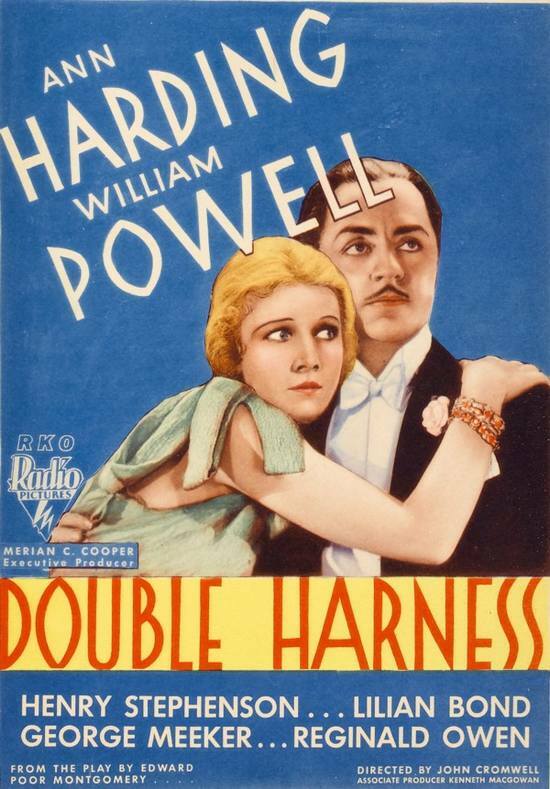 The only historical consensus about the humble little clip seems to be that it was created during the Roaring 20s, like the Holdfast Hair Pins, for flappers coping with their newly cropped dos; but whether the clever ribbed metal device was the brainchild of Bobby Pinsworth, Luis Marco, or someone else altogether, its true creator remains a beautiful mystery. 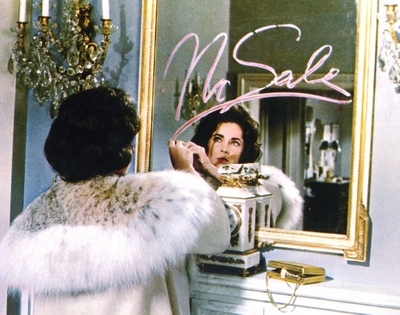 Thanks to STX ENTERTAINMENT, I have two wonderful prizes for Vintage Powder Room readers. FIRST PRIZE: Two pairs of tickets to see an advance screening of the movie THEIR FINEST, on Wednesday, April 5, 2017 –AND—a copy of the book by Lissa Evans that inspired the film! SECOND PRIZE: One pair of tickets to see an advance screening of the movie THEIR FINEST, on Wednesday, April 5, 2017! 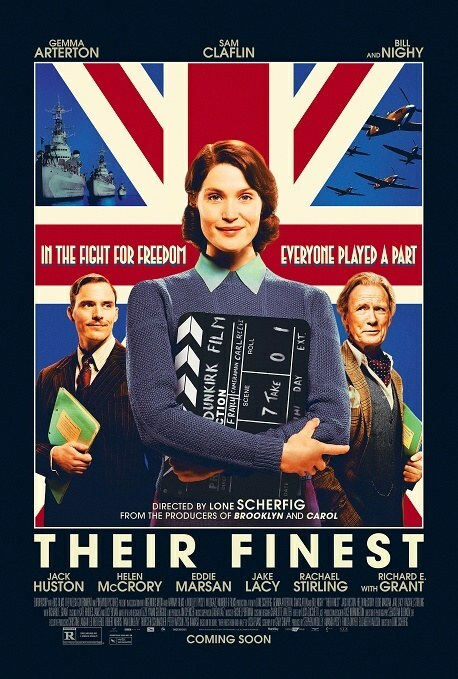 About THEIR FINEST: With London emptied of its men now fighting at the Front, Catrin Cole (Gemma Arterton) is hired by the British Ministry as a “slop” scriptwriter charged with bringing “a woman’s touch” to morale-boosting propaganda films. Her natural flair quickly gets her noticed by dashing movie producer Buckley (Sam Claflin) whose path would never have crossed hers in peacetime. As bombs are dropping all around them, Catrin, Buckley and a colorful crew work furiously to make a film that will warm the hearts of the nation. Although Catrin’s artist husband looks down on her job, she quickly discovers there is as much camaraderie, laughter and passion behind the camera as there is onscreen. Sounds wonderful — right? Well, read on for details on how to enter the drawing to win a prize. 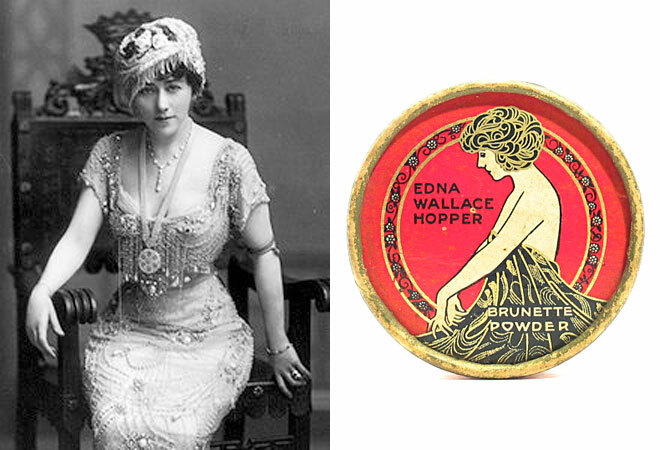 To enter the drawing, email me at: joan@vintagepowderroom.com with the answer to the following question. Which of the following ministries was formed in Britain in September 1939 (following their declaration of war) to issue domestic propaganda in the form of publicity posters, press releases, radio programs and films? RULES: Entries must be received by 12:00 MIDNIGHT PST on SATURDAY, APRIL 1, 2017. Winners will be selected by random drawing from those people who correctly answer the question. One entry per person, please. 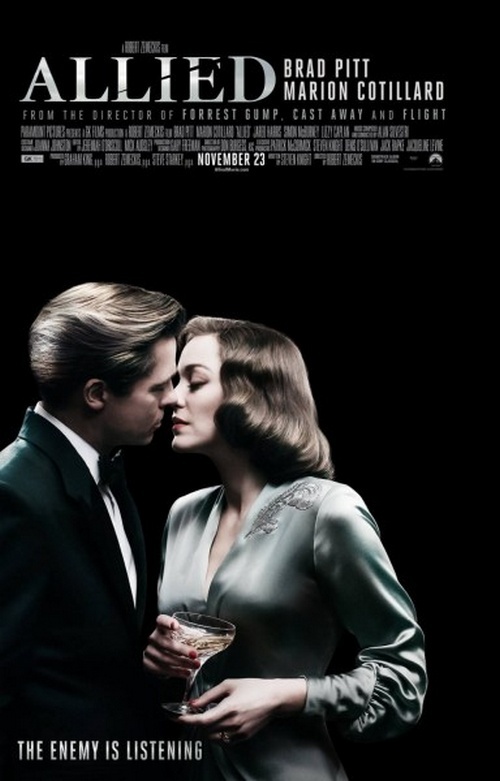 Winners must be able to get to the Hollywood Arclight Theater by 7 pm on Wednesday, April 5, 2017. I will contact the winners via email and include all instructions for claiming your prize. GOOD LUCK! Having lived in Southern California for most of my life I have a soft spot for the car culture that is woven into the strands of the area’s DNA. I had a classic fire engine red 1965 Mustang that was totaled in an accident years ago and I still mourn the loss. When I discovered this Mi-Lady Hair Net package in an online auction recently, I knew I had to have it; the little roadster is irresistible. The automobile has had a profound effect on L.A.. 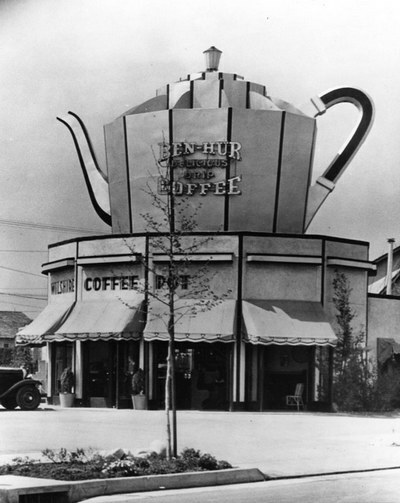 While these days we have a tendency to focus on the negative impact of cars on the city–traffic, traffic, and more traffic–during the 1920s and 1930s, cars inspired a trend in architecture that would have made what Alice saw down the rabbit hole seem mundane. 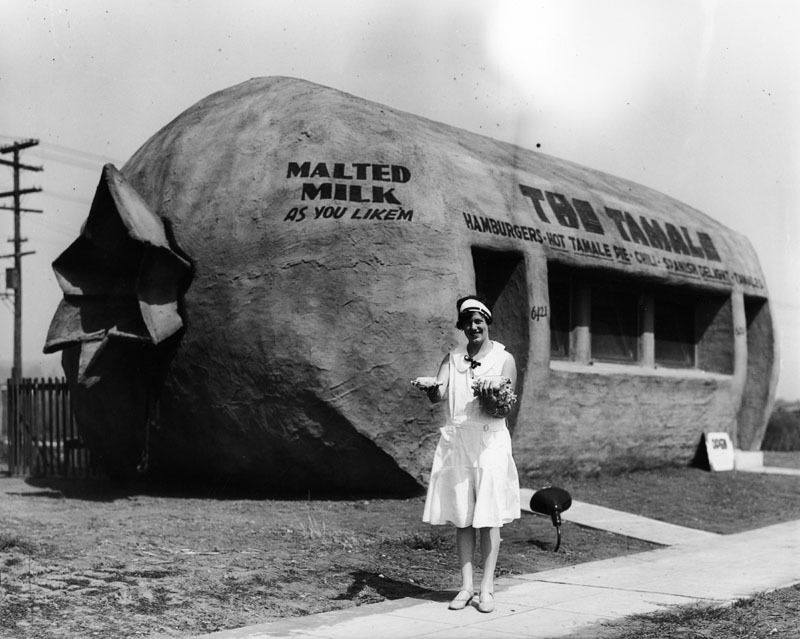 Programmatic, mimetic, and novelty are terms that describe the whimsical style of architecture that was at its peak during the 1920s and 1930s. Structures were built to resemble the products or services they offered, the buildings were designed specifically to attract the attention of people as they passed by in their automobiles. 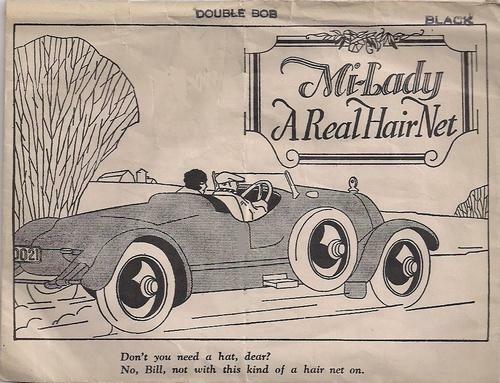 Even though the 1920s era auto depicted on the Mi-Lady envelope is a European model with right hand drive, I envision the couple tooling around Los Angeles in it. They could be newlyweds on a daylong excursion of dining and shopping in various novelty buildings. 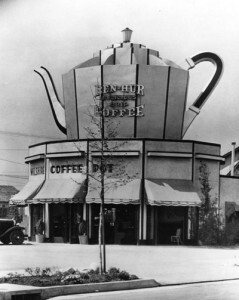 The pair begins their day by grabbing a cup o’ Joe and a pastry in a building shaped like a giant coffee pot. Later in the morning they find themselves craving freshly squeezed orange juice, so they pull into a café shaped like, what else, a giant orange! 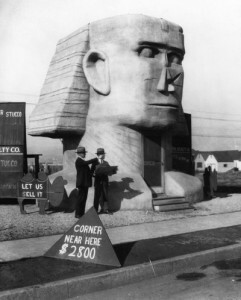 The newlyweds long to find a sweet California bungalow to call home; so they are ecstatic when the salesmen at the Sphinx Realty Company, located in a replica of the Egyptian icon, help them track down their dream house. After making a down payment on a cozy cottage, the couple decides to purchase a piano—just the thing for evening sing-a-longs with family and friends. 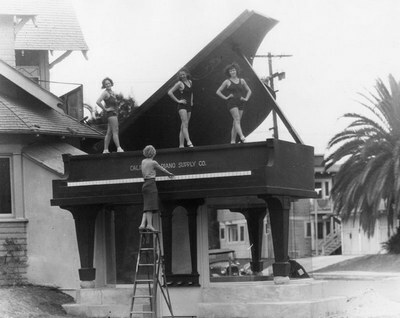 With a colossal piano marking the entrance to the showroom, the California Piano Supply Company is the ideal place to shop for a baby grand. Following bowls of chili at The Tamale in East L.A., the couple fire up their little sports car and speed off into the warm Los Angeles night.